Background: Adult-congenital diaphragmatic hernias and chronic traumatic diaphragmatic hernias are uncommon entities that are often technically challenging to repair. But improvement in laparoscopic techniques and the vast experience in treating hiatus hernias by the advanced laparoscopic surgeons made them possible to treat such cases laparoscopically with better outcome. 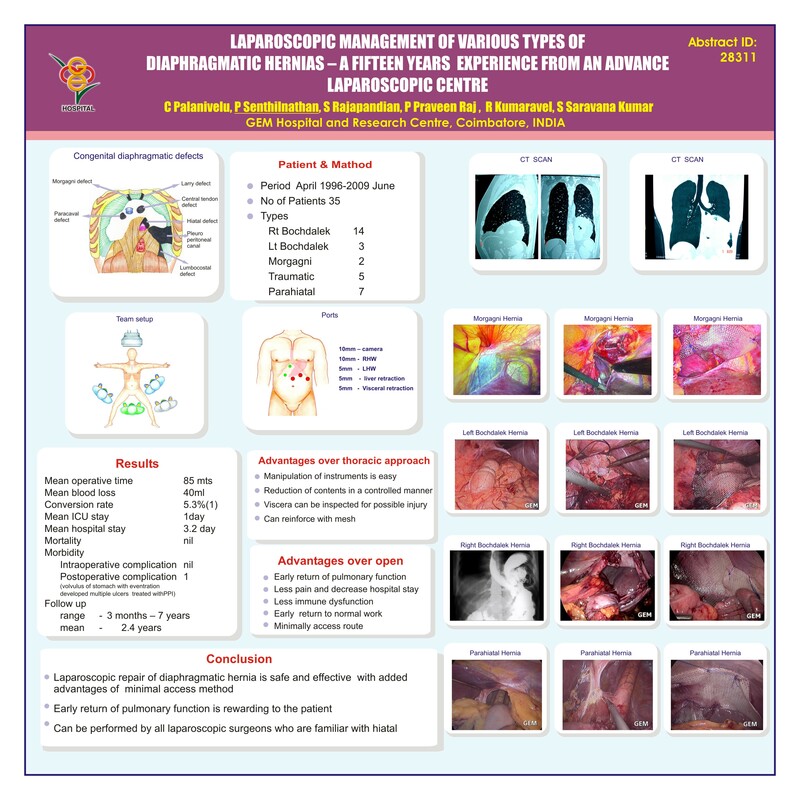 Materials and Methods: Thirty five different types of diaphragmatic hernias were managed laparoscopically between April 1996-2009 June. Out of 35, fourteen were left Bochdalek, three right Bochdalek, two Morgagni, five chronic traumatic diaphragmatic hernia, seven parahiatal hernia and four were eventration with volvulus. In the total 35 cases, 21 were male and 14 female. One of our early case presented in her second trimester pregnancy. The mean age was 40.5(21-65) years. Three to five ports were used in all the cases. Two 10mm and three 5mm . All the cases were done by total laparoscopic method except one, which was opened due to gangrenous colon. Results: All the patients had excellent recovery. The mean operation time was 85 mts. The mean blood loss was 40ml. The mean ICU stay was 1 day. The mean hospital stay was 3.2 days. The mortality rate is nil. Conclusion: Laparoscopic repair of diaphragmatic hernias is safe and effective and gives better outcome than its open counter part.